Hi folks! Ruthie here with Arizona Oriental & Specialty Rug Care and today I wanted to share a little bit about a rug that we have hanging in our shop known as an Afghan War Rug. It’s certainly a far cry from the usual floral or animal motifs in other Afghan rugs! I’ve talked in other articles before about how certain animal figures mean different things - camels represent wealth, for instance. But let’s take a moment to talk about how these symbols change and one of the other ways that rugs tell stories! So...WHAT THE HECK IS A WAR RUG!? “Baluch” is actually the technical name for a War Rug - used by dealers, collectors, and commercial galleries. They started to show up in the early 80s, after Russia began its occupation of Afghanistan in 1979. 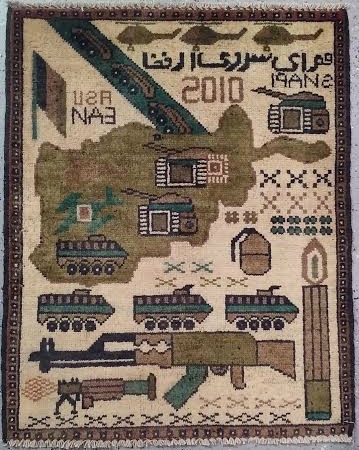 When this region began to be occupied by war, images of tanks, bazookas, helicopters, and even machine guns began to be woven into rugs. The military presence in this region was reflected in the weaver’s work. It makes sense that the intricate patterns in these area rugs are inspired by what is familiar to the weavers. There isn’t a clear message that the weavers are trying to send, at least not that anyone has been able to figure out anyway. Something that collectors (and myself) can all agree on, though, is that these little rugs are very interesting. Sadly, they also tell a lot about what is most prevalent in the lives of weavers. I think to some extent, the weavers have begun using these motifs to attract buyers. Many soldiers bring back small area rugs as mementos of their experiences and travels, so why not a war rug? It’s most certainly original! Russian soldiers, and later American soldiers, seem to have been the target audience and market for these rugs. These rugs are then brought back home from overseas and sold here. We’ve even seen area rugs that reflect our own World Trade Center Towers and the devastation we experienced. Yes, even America’s own history is being commemorated in these War Rugs. I still think that rugs with pretty flower and animal motifs on them are my favorite, but how can anyone not take notice of these war rugs and the history carefully knotted into them? It definitely makes you think about how these weavers must live their day-to-day lives.